Last week, our athletes returned from the prestigious Grand Final, held in Portimao, Portugal, from 4. to 11. November. 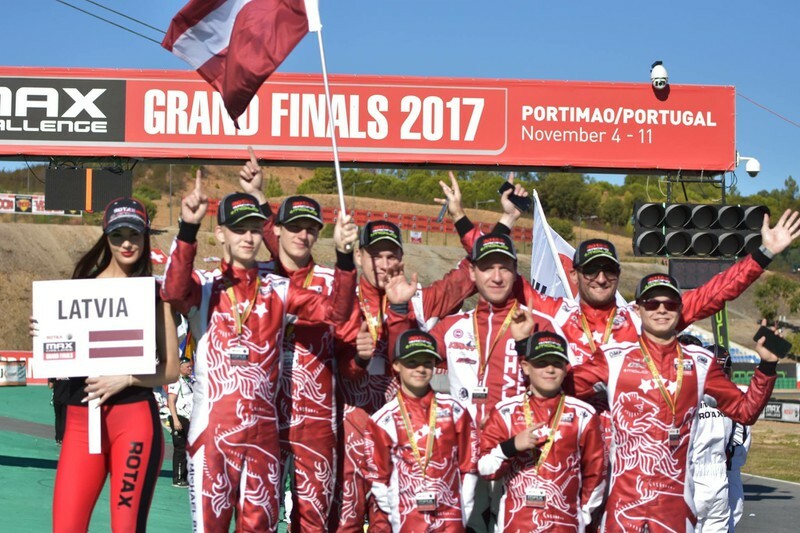 The 362 best riders from 59 countries came to the Rotax Max Challenge Grand Finals 2017, which lasted for a whole week in the south of Portugal - "Kartodromo Internacional do Algarve". The winners of the national and regional championships from all over the world qualify for these world-wide competitions, which are being organized for the eighteenth year in a row. Unfortunately, this year also, none of the riders succeeded in conquering the place on the honorary pedestal, but some achievements are considered very high and overall we are truly proud of our talented riders. In Portugal, Latvia was represented by eight riders, and the Baltic States in total by 13. - Iļja Aļoškins (DD2 Masters) - 42th place, not qualified for the final, Gatis Vītols (DD2 Masters) - 63rd place, did not qualify for the final. Ivan Tkachev - 12th place, Karl-Markus Sei - 28th place, Priit Sei - 38th place, Marius Povilaitis - 68th place Ragnar Veerus unfortunately has been disqualified from the race. Aigars Zviedris about his son, Valters, achievements in the race: "Valters started the final race very loudly and until the 8th circle stepped up to the 14th place, but then, due to risky regulation, the engine began to overheat and lose speed on the track, and the seaman had to lose several places and finish was at the 19th place. We are glad of the speed shown by Valters and the fighting strength. It's a pity that we did not think about generic regulation for the final race, then the final result could be much better, as was shown by the ninth fastest lap time in the final race. We just went to the identified risk with the aim to fight for the Top5 place - this time it failed. " Mareks Štolcermanis, Tomass Štolcermanis dad and coach: "Tomass started in the Mini class, with all the training in the competition of 36 participants presenting the ten-minute lap times. The qualification was not so successful and won the 21st place on the hit. After both hits, he got the 19th place in the semifinals. From the 19th semi-finals, he won a high 7th place in a lasting fight and success, but one of the front-players received a penalty and Thomas won the 6th place for the final. In the final starting from the outer edge of the first round of battle and collision lost to the 10th place. During the course of the race, he fought to the 8th place and, in the last round, fought to the last, overcame and ended up at the 10th place. Our goal was to be the tenth and we achieved it! We have realized that we are strong and we can also fight for Top 5. " DD2 Master Class Iļja Aļoškins notes that this was a similar unsuccessful start to the race. "For me personally, this was the fifth competition here. In the past, every year I am just happy to have the opportunity to be there, to participate and learn, but this year I was ready both emotionally and physically fit to the last meters and the desire to achieve my own personal record Top 10 seemed real. The technique was very good, and the speed on qualifying trips was very similar to the leaders, but unfortunately I was a little slow in one lap and paid off later. So, I did not take part in the finals. Overall, the atmosphere of the race is unique and great. There is an adrenaline on both the track and outside I would like to congratulate our most successful Latvian riders who achieved really good results - Valters Zviedris, Tomass Štolcermanis and Mārtiņš Janovskis. I especially want to commend Mārtiņš Steinerts with excellent performance and high standing in the finals. " High - 9th place DD2 class rider Mārtiņš Steinerts: "This time, unlike the previous two years, all the miles were not fast enough, because there was a missed engine that fought until the final day. After training, it was clear that we tried all the possible chassis and engine regulation, I myself have been reflecting on every turn of the track while looking for guilty driving, but the lap times remain unchanged and, at best, we were able to qualify for the top 30. Qualifications managed to get behind a slightly faster rider and show off 13. The fastest lap time in their group and 27. Among all riders. After finishing the qualifying hats, I finished twice in place 13 and once in 18th, which was not encouraging, but at that time the technique did not really go faster, and these lines also had to be fought in a tough fight. The next day we were awaiting a semi-final ride from which I started from position 14 and managed to finish 7. (few riders got penalties, which made it possible to climb 3rd after the finish). After the semifinals, we realized that this year we will not be able to fight for positions at the forefront, because the engine obviously lacked the power and we could not influence it. In the last hope, we went to the Rotax representatives and after long negotiations we agreed that the engine will be tested and replaced the necessary parts with new ones. We watched the final without hope for a good place, because we traveled around the 15th place in the group, totaling about 30th place, but still I was tune in to do all that would be in my power. In the final race from the 20th place, I did not succeed in getting up, because several riders climbed in front and had to brake, but after a few laps I realized that there was a good pace at last and I began to overtake the riders first by one. It was successful to get through the larger rider groups that fought each other and dropped out of them. In the last rounds I have already approached the group of leaders and it was motivating to move forward even faster. As a result, I finished the ninth, just behind three more riders who fought for sixth place. The result achieved me this time, because I had not hoped that I would be able to get so high starting from the 20th place, when all around the world are riders and the lap times are practically the same for everyone. This year was also pleased that all Latvian riders were united and tried to help each other to achieve the best possible results. For those who won the final race, they also managed to show their speed and remind their competitors once more of the fact that even riders come from Latvia. The event itself and the organization are always at a very high level, the race venue was perfectly suited and appropriate for this level of racing, as well as the weather did not end in joy, because all the long miles were shining in the sun and was warm "
Until now, the biggest success of the Latvian athletes in this race is Konstantīns Calko second place in class DD2 in 2012. We are truly proud of Latvia and, in general, of all Baltic riders. The experience gained from year to year will definitely result in a place on the honorary pedestal one day, so we continue to work, develop our strengths and meet the track in the 2018 new season.